Scarecrows, why you gotta be so mean? There, we said it. We all know that scarecrows can be kind of creepy, what, with all standing out there in the middle of the field to keep the crows away and all, but that was before we heard about spooky scarecrows coming in to haunt the villagers at night. That's totally not cool! Well, maybe it's a little cool. At least as long as it's your kid dressed up as the frightening villain. We're sure that having your girl dress up in a scarecrow costume will all just be fun and games, some classic Halloween fun, and that there won't be a single thing that's twisted or evil about it. Right? 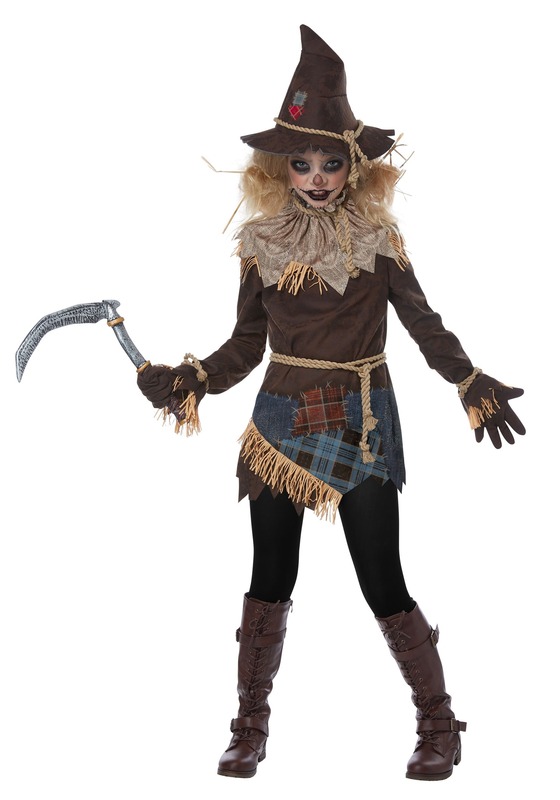 She'll be ready to become a terror with this detailed girl's creepy scarecrow costume. The costume tunic has patchwork and straw details, and rope accents will have her looking like a homespun scarecrow. The hat completes the look, and all she'll need is her own leggings and boots for the outfit. Complete her look with some spooky scarecrow makeup, and we're sure she'll be quite the terror! This costume ensemble is the perfect way to combine modern style with a classic costume theme. She can enjoy becoming a frightening terror on Halloween night, but let's just remind her to not go about scaring folks after the trick-or-treating or costume party is over. With a look this creepy, this girl's costume is going to be ready to scare away more than just the crows!